Email payment is the only payment option currently available, please see the Credit and Debit card section below for details why. Question and answer will be "military"
No Credit Cards or Debit card payments will be accepted at this time due to some security concerns with the current setup. NO data or CC numbers of any kind were taken. 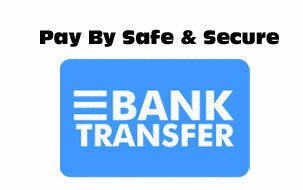 But breaches were attempted and in an effort to protect your personal data 100% we have made all payments Bank Transfer only until we can get a fully protected and secure card payment option running to our satisfaction. This payment option is only for local customers who want to select items and then come on down and pay in person*(please read below for this option). Customers can also pay online using out e-transfer option then contact us for pickup. We will be happy to refund the shipping costs in that scenario. We cannot hold pickup carts longer than 1 day, and no guarantees on product availability will be made, so we suggest this option is used only if you plan to come down the same or next day. *If pickup is chosen but the order is not picked up and paid for within a day we will not hold the selected product and will treat your cart as abandoned. We only hold pickup orders if paid for before hand OR we are contacted to provide us with details on when pickup/payment will be done. If contacted we will hold orders up to 5 days, no longer. Item(s) purchased that clearly do not match the pictures and/or descriptions listed on our website. Missing item(s) not shipped. Incomplete orders are rare, and we triple check every order that goes out to ensure we are sending exactly what was purchased. Some refunds may be sent by Poco Military before shipment. This occurs if our inventory system has listed something for sale not actually in store (ie: Stolen, listed in error, wrong bar code etc.). We will notify the customer of errors like this and offer: immediate refund, alternative similar product(s) or the chance to wait on the correct item(s) to arrive in our warehouse for shipment. If a customer is charged more for products than what is listed online a refund for the difference will be sent back as soon as possible. All prices are updated in real time, so this should not be a big issue, and these types of errors in prices will be cleaned up quickly as possible. Refunds will be sent via the payment type used by the customer. PayPal refunds work quickest and will be offered to those customers who may of used Authorize.net as the payment type of they do not wish to wait on that service's longer refund turnaround time. Return shipping costs will be the responsibility of the customer. The shipping fees will be billed and paid for before any exchanges are completed. Extra costs associated with exchanged items costing more than what was originally paid for will result in in an extra amount being billed and paid for before any new product is shipped back in an exchange situation. How much is shipping going to cost me anyway? Based on weight and size of a order's items, our shipping calculator will give you a accurate price on shipping fees. These fees are not up to us, and are exactly what we get charged by Canada Post to ship orders. We also offer a flat rate, which usually will be lower than the exact costs quoted for Canada Post, but with this option we choose the cheapest shipper we can find. Wont always be Canada Post. What's the deal with tracking numbers? Canada Post only includes tracking codes with packages that weight over 1KG, anything under that will get hit with a hefty extra fee if a tracking code needs to be added. Please ask at time of purchase if you want to be sure to get a tracking code, a extra fee may then apply. Couriers usually include codes with any package, but overall tend to be more expensive than Canada Post to ship items. We use Canada Post for most shipments, and Purolator (or Canpar) for orders that require ground shipment only (ammunition) or when the customer prefers a courier based shipping solution. How long will be order take to get to me? If we have the items you ordered on hand we can get them shipped to you upon payment between 1-3 weeks. If we have to order some or all of your order from suppliers expect shipment between 4-8 weeks. This may take longer on out of stock items dependent on how fast our suppliers send us new stock. How is the shipping of my order handled? We take the up most care when shipping your orders. We tend to over pack most shipments to avoid any chance of breakage or damage of any type. Why is it that sometimes my orders take longer to get to me than others? 99% of the time orders do get to the correct address in a timely fashion. But delays can and have happened before, especially for orders going outside of Canada. Are there any other ways to order from you other than using your online store? Yes. You can e-mail us your order and collect at the store. We do not accept payment over the phone, so we would work out a e-transfer with you or do in-store payment. Any orders done this way must be complete with 2 days or else all product ordered will go back into the store. Why don't you have more size choice in the surplus clothing? Often the surplus market only has certain sizes available at that time. It's rare that we get many XL sizes and above, but if you would like to contact us about getting some of the larger sizes we will put you on a waiting list. We will contact you when your size becomes available and before we put it on the web site. If the size of the item is wrong, you will be responsible for any shipping fees for the return and/or replacement size sent back to you. Defective merchandise will be handled on a case by case basis via email. We will do our best to work out any issues quickly. What if I order item(s) that are out of stock? Our new system has live inventory so you will see what is in stock and what is not at all times. Some stock will have the option to be checked out and paid for even if there are none in stock. These will be called back orders and be shipped as soon as more product comes in. Not all product will have back order status attached as not all product is easy to re-stock or will be re-ordered more than once of twice. Canada Post is our default shipping agent, and has been a very reliable one for the last 10 years for us. Special shipments using Purolator, CANPAR or UPS can be set up with us on a case by case basis and may require further shipping fees over above what may of been charged already.